Romans 15:13-14 I pray that God, the source of hope, will fill you completely with joy and peace because you trust in him. Then you will overflow with confident hope through the power of the Holy Spirit. I am fully convinced, my dear brothers and sisters, that you are full of goodness. I've had many people in my life that probably thought I was full of something! Knowing Jesus as my Lord and walking by faith as a follower of Christ, I know today that I am full of goodness! I think that many times we make premature judgements about some of the people in our lives. We see things on the outside or hear things said and decide what lies on the inside. 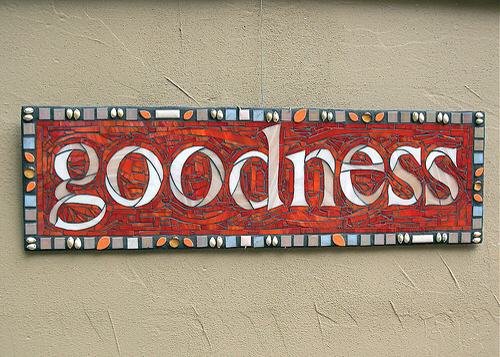 Perhaps I am too trusting many times but I'd like to think that we are all filled with goodness. I'd like to believe that our bad associations and choices cover up the goodness at times but its still there. When we strive to be completely surrounded by joy and peace by trusting in Christ, we too can find that deep, deep on the inside we are full of goodness too! I'm fully convinced that YOU are full of goodness!